Most carpet cleaners just use the old manual scrub wand method because it has been around for over 40 years. Using a manual wand requires a great deal of physical labor and only cleans from two directions, often producing only mediocre results. The manual wand is old technology. 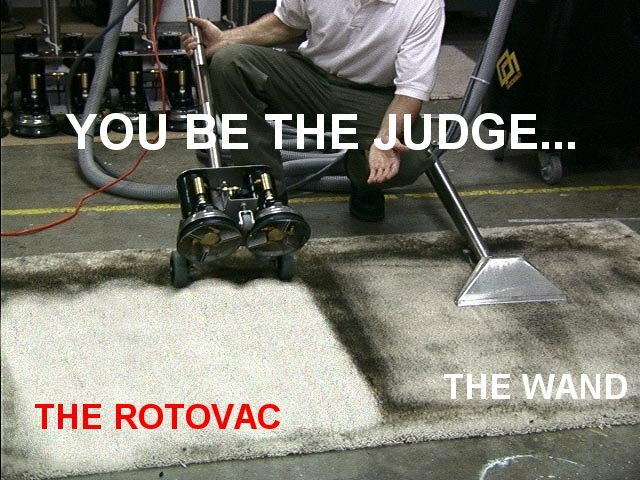 The Patented Rotovac® Powerwand operates with one hand like an upright vacuum cleaner. There is never any need to bear down and scrub like a manual wand. The Rotovac® has dual high torque motors to supply all the cleaning muscle for you. The rotary vacuum heads thoroughly clean the carpet from all directions with hundreds of cleaning passes rather than just back and forth a few times like a manual wand. Rotary Vacuum Heads thoroughly clean the carpet from all directions with hundreds of multi-directional cleaning passes. The Rotovacs' motors supply all the cleaning muscle for you.